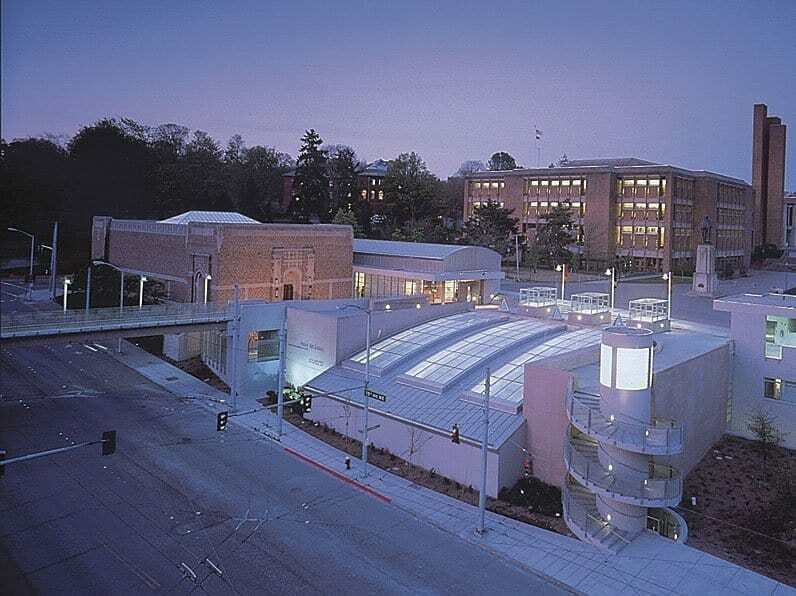 Initially intended to be the north wing of a large, symmetrical arts complex that was never realized, the “old” Henry now contains the permanent collection galleries, Reed Study Center and curatorial offices. Gwathmey Siegel Kaufman’s three-story addition offsets the original structure with textured stainless steel, cast-in-place concrete and cast-stone. It houses flexible, top-lighted galleries, administrative offices and loading, storage and conservation spaces, as well as a new lobby, museum store and lecture theater. But perhaps most important, the intervention visually separates the museum and addition from adjacent structures, affording a legitimate transition, a new sense of place, an expectant and enriched entry sequence and an integration of site, circulation and context. In counterpoint to the original Henry, the new main gallery constitutes a memorable form to be re-experienced from within. The addition also acts as a carving away of a solid, revealing fragments that interact with the original Henry to re-site it as the asymmetrical—though primary—object in a new contextual frame, unifying the multiple architectural and site issues at the end of Campus Parkway. Finally, the intervention is an architectural collage that unifies disparate elements in both contrapuntal and asymmetrical variations. The variations reestablish the primary site axis to Suzzallo Library, reconcile the vertical transition from the street to the plaza level and integrate the original Henry facade both with the new sculpture court and gallery entry and with the campus entry. As fragments, the forms imply but do not directly reveal their spaces. Thus anticipation, sequential revelation and memory become as crucial to the experience as the physical manifestation of the complex.